Robbie LeBlanc (from Blanc Faces) together with Swedish producer and musician Daniel Flores is the team behind this new super constellation Find Me!! With contributions from the Swedes Sören Kronqvist (Crash the System, Sunstorm), Erik Mårtensson (Eclipse, W.E.T., Jimi Jamison), Daniel Palmqvist (Xorigin) and Johnny Trobro. The regular Frontiers songwriters Alessandro Del Vecchio (Hardline) and Martin brothers Tom and James (Vega, Sunstorm) have also been involved in this project and together they have created a very strong AOR album with tons of Journey sound! LeBlanc has an amazing clear voice and fits like hand in a glove for this kind of rock music. Magnificent melodies and a crystal clear production as usual from Flores must attract all fans of melodic rock and AOR. I had plenty of time to get this one album into my musical head and it's hard to find anything negative to write about it. Perhaps the band's name? It's the only thing that is misleading, because musically it's absolutely wonderful and easy to consume. Very catchy guitars, super shiny harmonies, stunning vocals and spicy choruses. Positive and high quality tunes make this album one of 2013's biggest newcomers/surprises in this genre. The top songs on 'Wings of Love' have a higher pace and nice groovy sound that I like. Like 'Bottom of My Heart', 'Road to Nowhere', 'Another World' and 'Firefight'. 'Unbreakable' is maybe the best single track, if I had to pick out just one favourite song. 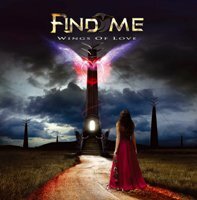 The title track 'Wings of Love' is another great AOR song with loads of melodic rock rhythms. Ok, I must admit: I love ALL twelve tracks and this is maybe one of Frontiers Records President Serafino Perugino's most awesome dream projects ever. I stand up and give this album my highest praise. Very solid work and I demand to hear more from Find Me in the future. This trans-Atlantic group releases a high class AOR/hard rock album in the very first try that is for sure! Both my thumbs are up! !